Gary C. Young has over forty years of experience in processes involving the energy, food, agricultural, chemical, and pharmaceutical industries, with companies such as Conoco, Stauffer Chemical Company, Beatrice Foods Company, Monsanto Company, and Carus Chemical Company. He has done consulting in areas of research and development, troubleshooting plant operations and process bottlenecks, maintenance, engineering, and environmental challenges. Dr. Young is the founder and owner of Bio-Thermal-Energy, Inc. (B-T-E, Inc.). 1 Introduction to Gasification / Pyrolysis and Combustion Technology(s). What is Mass Burn (Incineration)? Which Thermal Process Technology is the Most Efficient and Economical? What is the Economic Comparison Between the Thermal Processes? 2 How Can Plasma Arc Gasification Take Garbage to Electricity and a Case Study? Logical Approach for Future Progress. 3 How Can Plasma Arc Gasification Take Garbage to Liquid Fuels and Case Studies? MSW To Syngas to Liquid Fuels Via Chemistry (Fischer–Tropsch Synthesis) and a Case Study. MSW to Syngas to Liquid Fuel via Biochemistry and a Case Study. 4 Plasma Economics: Garbage/Wastes to Electricity, Case Study with Economy of Scale. 5 Plasma Economics: Garbage/Wastes to Power Ethanol Plants and a Case Study. 6 From Curbside to Landfill: Cash Flows as a Revenue Source for Waste Solids-to-Energy Management. 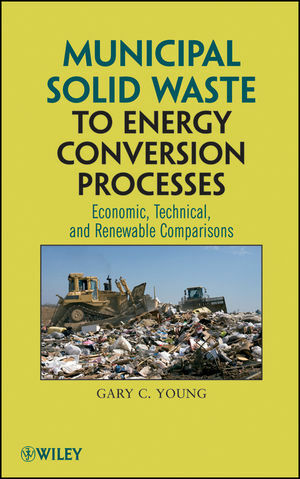 7 Plasma Economics: Garbage/Wastes to Power, Case Study with Economics of a 94 ton/day Facility. More Recent Events About the Project. 8 Plant Operations: Eco-Valley Plant in Utashinai, Japan: An Independent Case Study. 9 Municipal Solid Waste and Properties. What is Municipal Solid Waste (MSW) and How Much is Generated in the United States? 10 MSW Processes to Energy with High-Value Products and Specialty By-Products. Production of Ammonia (NH3) from Syngas via Chemical Synthesis Route. Production of Gas to Liquids from Syngas via Chemical Synthesis Route. Production of Methanol (CH3OH) from Syngas via Chemical Synthesis Route. Production of Synthetic Natural Gas (SNG) from Syngas via Chemical Synthesis Route. Production of Hydrogen (H2) from Syngas via Chemical Synthesis Route(s). CO2-Rich Separated Gas Stream/Conventional Turbine Expander. Production of Ethanol (CH3CH2OH) from Syngas via Chemical Synthesis Route. Production of Ethanol and Methanol from Syngas using Fischer–Tropsch Synthesis Process. Production of Ethanol from Syngas via a Bio-Chemical Synthesis Route. Production of Ethanol via a Combination of Chemical and Bio-Chemical Synthesis Routes Using Biomass (Cellulosic Material). Oxosynthesis (Hydroformylation): Syngas and Olefinic Hydrocarbons and Chemical Synthesis. Slag or Vitrified Slag or Ash from Gasification Reactor and Specialty By-Product Options. Vitrified Slag, Slag, and Ashes: Research and Development (R&D), Marketing, and Sales. Process for Resolving Problems with Ashes. Production of Road Material from Slag and Vitrified Slag. Production and Uses of Rock Wool, Stone Wool, and Mineral Wool. Destruction of Asbestos Wastes via Vitrification. Discussion of Potential Markets for the Vitrified Slag. 11 MSW Gasifiers and Process Equipment. Lurgi Dry-Ash Gasifier and British Gas/Lurgi Gasifier. Alter Nrg Plasma Gasifier (Westinghouse Plasma Corporation) System. Phoenix Solutions Plasma Arc Torches, Phoenix Solutions Company (PSC). PyroGenesis Plasma-Based Waste to Energy. Integrated Environmental Technologies, LLC (InEnTec). Thermoselect Process by Interstate Waste Technologies. Primenergy's Gasification System at Moderate Temperatures. Nexterra's Gasification System at Moderate Temperatures. Pressure Swing Adsorption (PSA) Units. Combustion Turbine for Syngas and Gas Engine for Syngas. Siemens-Westinghouse Syngas Combustion Turbine for Syngas. General Electric (GE) Combustion Turbine for Syngas. GE Gas Engine for Syngas. Noncontact Solids Flow Meter for Waste Solids (RayMas® Meter). 12 Other Renewable Energy Sources. Big Wind Systems to Energy. Discussion of Economics For the Large Wind Farm Cases. Economy of Scale Associated With Wind Farms. Small Wind Systems to Energy. Discussion of Economics for the Small Wind Farm Cases. Hydroelectric Mill Dam: Nashua, Iowa. Discussion of the Nashua Hydroelectric Economic Analyses. Hydroelectric Mill Dam: Delhi, Iowa. Discussion of the Delhi Hydroelectric Economic Analyses. Hydroelectric Mill Dam: Fort Dodge, Iowa. Discussion of the Fort Dodge Hydroelectric Economic Analyses. Daily Flow and Production Methodology, Fort Dodge Mill Dam Hydroelectric Facility. 13 Waste Energy to Recycled Energy.